`We are the schmucks’ thundered President Donald Trump. The object of Trump’s wrath at his ‘Make America Great Again’ rally in Great Falls, Montana was the craven, stingy European members of NATO, only 16 of 22 members are on budget for their US-commanded military spending. Trump wants them to spend much more. Trump and his fellow neocons want NATO to serve as a sort of US foreign legion in Third World wars in Africa and Asia. NATO was formed as the North Atlantic Treaty Organization to defend western Europe, not to fight in Afghanistan and who knows where else? Equally bad, according to Trump, is that the US runs a whopping trade deficit with the European Union which is busy shipping high-end cars and fine wines to the US. The wicked foreigners don’t buy enough American bourbon, corn and terribly abused pigs. 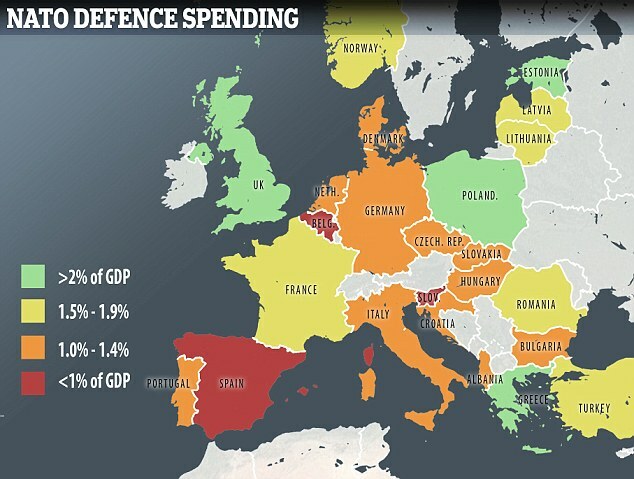 Trump is quite right that America’s NATO allies, particularly Germany and Canada, don’t spend enough on defense. Germany is reported to have less than twenty operational tanks. Canada’s armed forces appear to be smaller than the New York City police department. Equally important, most civilians don’t understand that neither US and NATO forces nor Russia’s military are in any shape to fight war that lasts more than a few days. Both sides lack munitions, spare parts, lubricants, and battlefield equipment. The overworked US Air Force, busy plastering Muslim nations, has actually run low on bombs. US industry can’t seem to keep up supplies. There has even been talk of buying explosives from China! These essentials of war have been seriously neglected in favor of buying fancy weapons. But such weapons need spares, electronics, fuel depots, missiles and thousands of essential parts. As former US Secretary of Defense Donald Rumsfeld observed, ‘you go to war with what you have.’ Neither side has enough. A war would likely peter out in days after supplies were exhausted. Besides, no side can afford to replace $100 million jet fighters or $5 million apiece tanks after a war, however brief. President Trump has learned about war from Fox TV. Europeans have learned from real experience and don’t want any more.